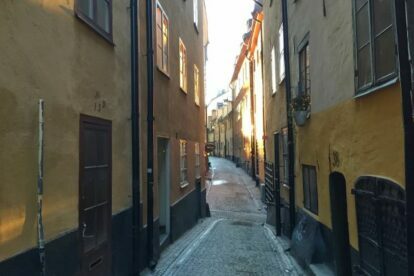 Take a stroll on what was one of the very first streets of Stockholm. Prästgatan is often overlooked by visitors to Gamla Stan, or the Old Town, simply because there is less than a handful of shops and only one restaurant found here. The main street, Västerlånggatan, runs parallel to Prästgatan, and steals all the attention having most of the trinket selling souvenir shops, foreign exchange outlets and restaurants on both sides of the street. Prästgatan on the other hand, lacking window displays and commercial signboards, has retained its original character of a medieval street making it a favourite location for films shoots. Prästgatan, or Priests Street, gets its name from the priests serving the main Cathedral Storkyrkan who have traditionally had their lodgings on Prästgatan 18. A tradition traced back to the 14th Century. During the 18th century, when for a period of years, Sweden had its own prohibition, when serving alcohol was banned, a number of illicit “speakeasies” could be found here, often underground in cellars. I come to Prästgatan regularly as I work here. But despite the fact that I’m in the very historic core of the city, I’m still surprised at how empty this stretch of street can be. Enjoy a moment of tranquil reflection on a street often unnoticed by locals and visitors alike.